In addition to articles about the United States labor movement and workforce, LSJ welcomes submissions that are international and comparative. We are interested in foreign based authors who are writing about relevant subject matter in non-US countries, which have significant international or comparative implications for labor studies. LSJ is interested in manuscripts using a diversity of research methods, both qualitative and quantitative that use ethnographic, theory-building, and formal econometric modeling. The Journal publishes empirical research in order to advance theory that expands understanding and analysis of the field of labor studies. LSJ welcomes innovative and new approaches to the study of workers directed at a general audience including union, university, and community based- labor educators, labor activists, and scholars from across the social sciences and humanities. The Labor Studies Journal is the official journal of the United Association for Labor Education and is a multi-disciplinary journal publishing research on work, workers, labor organizations, and labor studies and worker education in the US and internationally. The Journal is interested in manuscripts using a diversity of research methods, both qualitative and quantitative, directed at a general audience including union, university, and community based labor educators, labor activists and scholars from across the social sciences and humanities. As a multi-disciplinary journal, manuscripts should be directed at a general audience, and care should be taken to make methods, especially highly quantitative ones, accessible to a general reader. The Journal also reviews relevant books, audio-visual, and electronic materials. In addition, a forum for discussion of issues about work and labor is also included, as is a non-refereed section highlighting innovations in labor education. 1. Manuscripts should be submitted electronically at http://mc.manuscriptcentral.com/lsj, where authors will be required to set up an online account in the SAGE Track system powered by ScholarOne. 2. Submissions should be double spaced and limited to 30 pages, including abstract, tables, and figures. 3. Manuscripts should be prepared in accordance with The Chicago Manual of Style (16th edition, author-date system). Please note that Chicago’s author-date system uses in-text citation, instead of Notes, mostly in the form of author, year of publication and, where appropriate, page number. At the end of the manuscript, there should be a list of references cited in the text, with the year of publication following the name of author, and the titles of works being in headline style. c. The body of the manuscript, with the title listed at the top of the page. 5. Authors’ names or any other identifying marks should not appear anywhere other than on the cover page to maintain the double blind peer review process. Please review the Labor Studies Journal Review Policy here. 6. Figures and tables should be numbered separately and placed separately at the end of the manuscript. They should appear on separate sheets and be placed in the order they appear in text. 7. For more information about the types of articles published in Labor Studies Journal, click here. 8. Please direct any questions to the co-editors: Robert Bruno, School of Labor and Employment Relations, University of Illinois (bbruno@illinois.edu) and Victor Devinatz, Department of Management & Quantitative Methods, Illinois State University (vgdevin@ilstu.edu). Any conflict if interest should be disclosed by a submitting or publishing author. For more information about SAGE's conflict of interest policy, click here. All research articles should have a funding acknowledgement statement included in the manuscript in the form of a sentence under a separate heading entitled ‘Funding’ directly after your Acknowledgements and Declaration of Conflicting Interests, if applicable, and prior to any Notes and your References. For more information about SAGE's funding acknowlegements policy, click here. Submit reviews to Ericka Wills (willsericka@gmail.com). A list of books available for review can be found at the UALE website at http://uale.org/books_to_review. Submit manuscripts to Emily E. LB. Twarog, University of Illinois, School of Labor and Employment Relations (etwarog@illinois.edu). If you or your funder wish your article to be freely available online to nonsubscribers immediately upon publication (gold open access), you can opt for it to be included in SAGE Choice, subject to payment of a publication fee. The manuscript submission and peer review procedure is unchanged. On acceptance of your article, you will be asked to let SAGE know directly if you are choosing SAGE Choice. 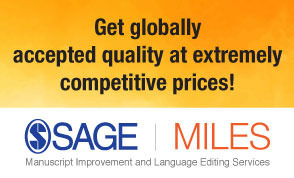 To check journal eligibility and the publication fee, please visit SAGE Choice. For more information on open access options and compliance at SAGE, including self-author archiving deposits (green open access) visit SAGE Publishing Policies on our Journal Author Gateway.